In 1998, she entered politics and ran for mayor of Lipa City, Batangas where she won by landslide victories in three consecutive elections. As the first woman mayor of Lipa City, she helped bring not just economic progress and infrastructure development to Lipa City, but more notably her various programs on public health, education and environment, which again earned various local and international awards and recognitions. In 2005, the University of the Philippines conferred her the Gawad Plaridel Award for her achievements and contributions both as an actress and a public servant. In the same year she was conferred with honorary doctorate degree (honoris causa) in humanities by the Lipa City College. She was again honored in 2006 by the University of the Philippines as one of the four awardees in UP’s First Diwata Awards. Dr. Vilma Santos is married to Senator Ralph Recto, who belongs to a well-known political clan in the Philippines. Together they have a son, Ryan Christian. She is also a mother to actor/model/television host Luis ‘Lucky’ Manzano, from previous marriage to actor Edu Manzano. Mayor Santos-Recto – ran for Governor in the 2007 elections challenging incumbent governor and jueteng lord Arman Sanchez and even her brother-in-law, Vice Governor Richard Recto (who is said to be not in good terms with his brother). People in Batangas were eagerly waiting for this match up. Mayor Santos-Recto’s decision to run for governor of the province of Batangas resulted in a family feud as Ricky,his brother-in-law, also said that he will run for the same post. After spending some time thinking about the predicament she was in, Mayor Santos-Recto said that she opted to give way to to Ricky but left people hanging as she said that she had until March 29 to decide and that it was still a long time before that date and anything may still happen. Mayor Santos-Recto was then being said to be interested in running as Congresswoman representing the 4th District of Batangas. To add spice to the situation, Vilma’s husband re-electionist Senator Ralph Recto announced to the media that they would not support the candidacy of Ricky. During the weekly flag-raising at the Lipa City Hall last March 5, 2007, political leaders from different parts of the province gathered at the Lipa City Hall grounds to announce their support and ask Mayor Vilma Santos to run as Governor. Mayor Santos-Recto was too emotional to make a decision at that point and asked for a week to make up her mind. 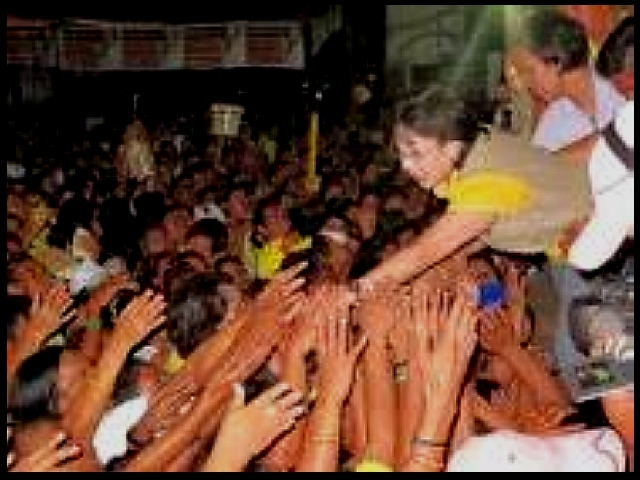 She made her promise good to announce her decision, and on March 12, she announced before a jampacked crowd at the Lipa City Cultural Center that she will accept the people’s challenge and run for provincial governor. Banker Edwin Ermita, the son of incumbent Executive Secretary Eduardo Ermita, will be her runningmate. She ran under the banner of Lakas CMD after being endorsed by Speaker Jose de Venecia as the official candidate of the majority party. Kampi adopted her as their official bet for Batangas Governor instead of incumbent Governor Arman Sanchez. Governor of Batangas was proclaimed as the duly elected Governor-elect of the province of Batangas on May 21, 2007 after garnering 475,740 votes against Sanchez’s 344,969 for a winning margin of more than 130,000. She will be the first female governor of Batangas (READ MORE). On November 16, 2009, along with her husband Ralph Recto, she moved from Lakas-Kampi-CMD to Liberal Party. First Female Governor of Batangas, Phils.